Skeeve has been voted both the second best sports tipster and the second best overall tipster in 2017 by SBC members. Skeeve has won the "outstanding contribution to tipping" award, a "lifetime achievement honour chosen by the SBC team", along with being voted the third best sports tipster in 2016 by SBC members. Starting with October 2016, Skeeve's picks are also proofed to Betrush. After a two-year absence, Skeeve is back in the Smart Betting Club Hall of Fame. 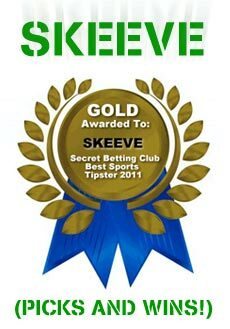 Smart Betting Club announced the winners of the (inaugural) 2012 Secret Betting Club Awards and the best sports tipster in 2011 is... Skeeve! Smart Betting Club re-reviewed Skeeve Picks for their magazine and confirmed the 'Hall of Fame' status. Smart Betting Club reviewed Skeeve Picks for their magazine and awarded it a 'Hall of Fame' status.